On his first full day in the job, however, Vin Nichols already finds himself in a spat. In interviews on the eve of his enthronement, the new head of the English church responded to Wednesday's release of the "very distressing and disturbing" Irish report on abuse in church-run residential and industrial schools. After first sending his "heart out" to the victims whose "stories are now told in public," Nichols said he was likewise thinking "of those in religious orders and some of the clergy in Dublin who have to face these facts from their past, which instinctively and quite naturally they'd rather not look at. "That takes courage," he added. "And also we shouldn't forget that this account today will also overshadow all of the good that they also did." 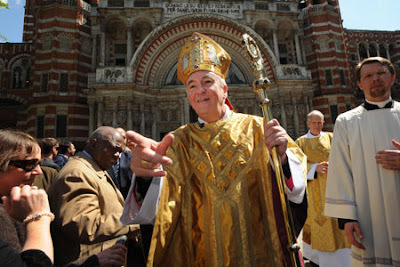 Archbishop Diarmuid Martin described as "unhelpful" comments made by the new Archbishop of Westminster, Vincent Nichols. The comments were also angrily condemned by victims in the wake of the major report on decades of abuse. Dr Martin distanced himself completely from Archbishop Nichols' clumsy intervention. "His comments, as reported, have not been helpful," Archbishop Martin told the Irish Independent. "My thoughts and anger are entirely on the side of victims," he added. "They are the real heroes of this story by finding the courage to come forward". In an attempt to "defuse" the situation, a spokesman for the Westminster church underscored yesterday that, in his interventions, Nichols "unequivocally condemned all abuse, and his heart goes out to all those who have been abused." London's archbishop likewise held that "the perpetrators of abuse should be held to account, and where the offences demand such action the perpetrator should face legal and police processes." As for Dublin, however, this isn't the first time Martin has sided with victim-survivors protesting a prelate; as the Cloyne storm shook an already-tattered Irish church earlier this year, the former Vatican diplomat publicly embraced an Augustinian friar who made an "atonement walk" across the Isle, calling for the resignation of Cloyne's embattled Bishop John Magee after his mismanagement of accusations came to light. Having refused to resign his post, Rome stripped Magee of his authority in early March, allowing him to retain his title but entrusting the Cork diocese's governance to an apostolic administrator. 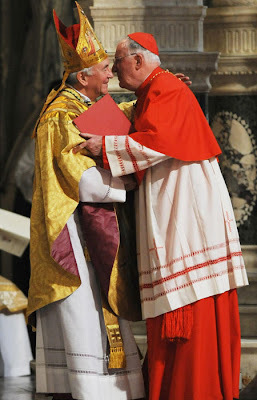 On another London note, while Nichols experiences the first storm of his tenure in the British capital, Cardinal Cormac Murphy-O'Connor fulfilled his "minor ambition" yesterday -- namely, becoming the first holder of the English church's top post ever to "get out alive." Now getting situated at a retirement flat, the first archbishop-emeritus of Westminster realized he needed to learn how to cook, so the BBC went along as the cardinal took a lesson from one of the capital's top chefs. "Great Is Truth. It Will Prevail."